Get all the National Park Quarters released in 2017 at a Great Price. 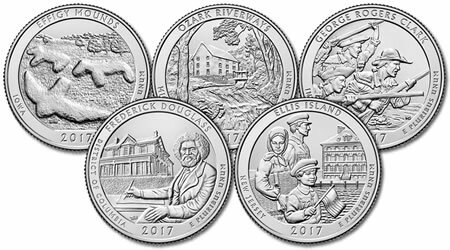 Included in this set are the Effigy Mounds National Monument Quarter, Frederick Douglass National Historic Site Quarter, Ozark Riverways Quarter, Ellis Island Quarter, and the George Rogers Clark National Park Quarter. All Quarters are in Uncirculated Condition. Both Philadelphia and Denver Mints.